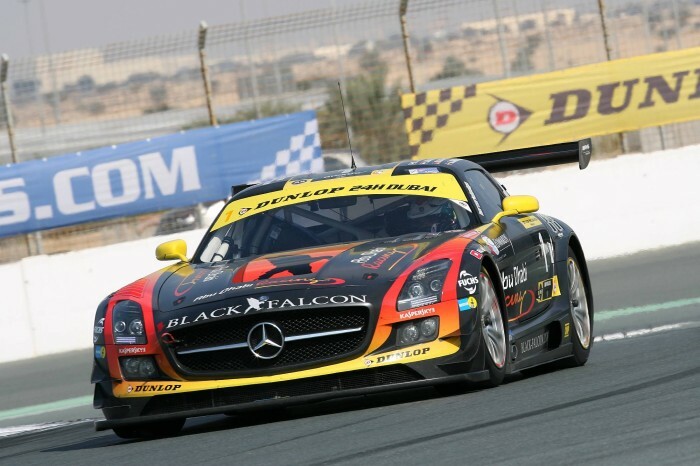 Third place overall for Black Falcon’s Mercedes-Benz SLS AMG GT3 driven by Khaled Al Qubaisi (UAE), Abdulaziz Turki Al Faisal (SAR), Hubert Haupt (GER), Adam Christodoulou (GB) and Jeroen Bleekemolen (NED) at the 24 hours of Dubai. After the SLS, which was leading for a long time, fell back due to technical problems and had to give up later on, the sister car could drive up into the top 3 of the strong starting field and brought home third place at the finish. With an excellent start Jeroen Bleekemolen was able to bring the Mercedes-Benz Gullwing of Team Abu Dhabi by Black Falcon straight into the lead. In the early hours of the race also the teammates Khaled Al Qubaisi (UAE), Bernd Schneider (GER), and Andreas Simonsen (SWE) had the pleasure of many leading laps, but then suddenly a technical problem forced them to the pits, first in front of and then into the box. The hoped for hat-trick of the team after the overall victories in 2012 and 2013 became an unreachable target. 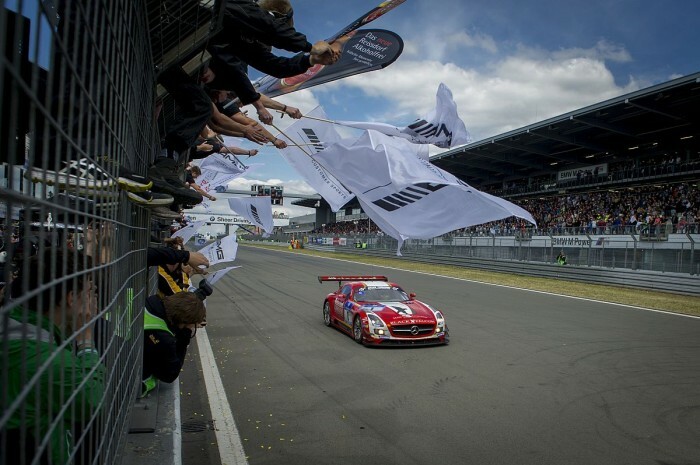 After a long repair break the SLS AMG GT3 went back into the race and the drivers started a spectacular comeback. But this year the luck was not on the side of Team Abu Dhabi by Black Falcon – again technical issues forced the car ultimately to surrender. 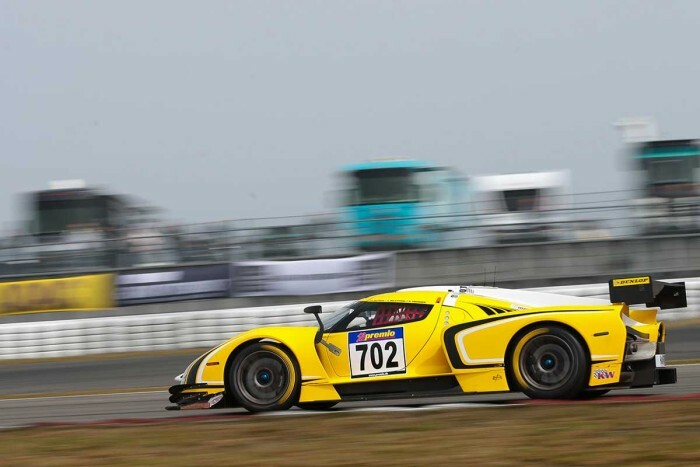 Now it was up to the crew of the sister car with the start number 2, the double starters Khaled Al Qubaisi and Jeroen Bleekemolen along with Abdulaziz Turki Al Faisal, Hubert Haupt and Adam Christodoulou to achieve the best possible result. Over the entire race distance the Black Falcon SLS was on the front ranks. All drivers drove fast and stayed out of any incidents on the route. Only a puncture and some damage to the wishbones meant time lost in the pits. However the team fought on and eventually achieved the third place overall at the 24h of Dubai the SLS when the chequered flag fell after 24 Hours racing. For Team Black Falcon this was again a very good result in the overall standings of the race in the desert. The Porsche 997 GT3 with starting number 44 with Burkard Kaiser (GER), Willi Friedrichs (GER), Arturo Devigus (SU), Andreas Fjord Bach (DN) and Vladimir Lunkin (RU) behind the steering wheel gave a lot of joy to the team. After a very good start in the qualifying the goal was clear from the beginning to break into the ranks of the more powerful GT3 cars and leave as many as possible behind. But all drivers were up to this task. Without major problems but with a high overview and fast lap times, five drivers kept on fighting hour per hour. At the end of the marathon, the whole team was happy about an outstanding 14th place overall and a 2nd place in class 997. In its series-level trim, at the start the second Porsche of Team Black Falcon was inferior to its class enemies on the paper, even before the start of the strong race. But Christian von Rieff (GER), Helmut Weber (GER), Gerwin, (NL) and Philip (NL) knew they would be fighting later in the race. Deliberately close to the technical specifications of the upcoming VLN season, the new 991 model showed its good long-distance genes. Like a swiss watch the Porsche with the established team turned round after round at the Dubai Autodrome – problems were a totally foreign word. With this performance, the crew of the starting number 156 was able to prevail against all except for one class opponent and celebrated their 27th place overall. Despite the missed the hat-trick, the ninth edition of the 24 hour race of Dubai with these results will remain in good memory.